The view below – the right half only – was first presented in Pacific Magazine on Sunday July 29, 1984. That was early in my figuring with the Times: the third year now of twenty-seven. I also included it in Seattle Now and Then, Volume Two, the second of three collections of the Times features that I self-published under Tartu Publications. (All are out of print now, although I have a few in “private” preserve.) I’ll use now most of the text from ’84, but I’ll also add some points, especially about the added left half of the pan. First, as a bit of a tease, I challenge the reader through the course of this little essay to locate the future site of the by now long-gone Roosevelt Theatre (later the Town) on the south side of Pike Street mid-block between 5th and 6th. Of course, you can cheat and jump to the bottom of all this and find it in a detail pulled from the panorama. 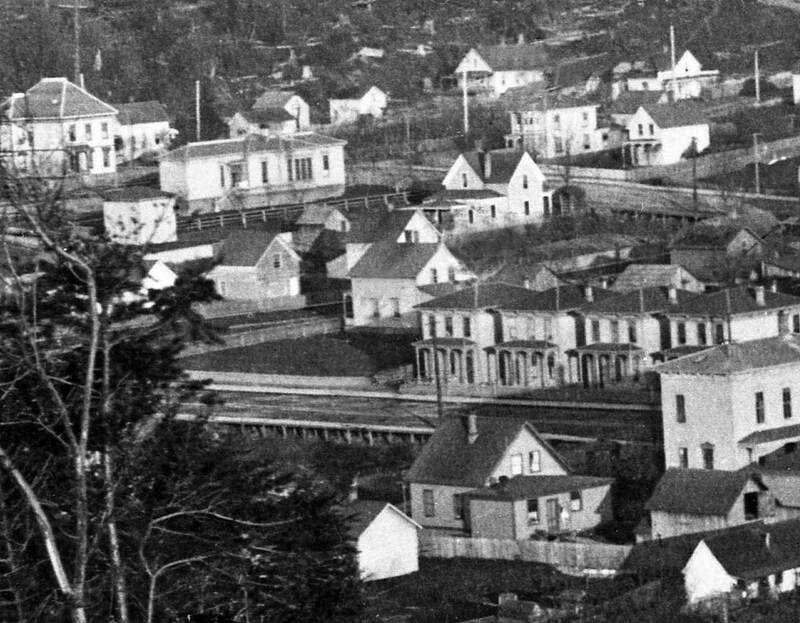 The pan was photographed in 1885 by I do not know whom from the southern slope of the southern summit of Denny Hill. (Roughly, Virginia Street ran between the hill’s two humps.) This is residential and academic Seattle. It includes the UW campus on Denny Knoll, left-of-center. The commercial district around Pioneer Place (or Square if you prefer) is to the photograph’s distant right and just this side of the tideflats. The tide is in and laps against the western side of Beacon Hill, the long ridge on the horizon. It was in 1885 that Arthur Denny began referring to this prospect – his hill – not by his own name but by what he hoped for it. He called it Capitol Hill. Denny schemed to kidnap the territorial capitol from Olympia and build the state’s new political campus on his hill. The extended rear of Arthur and Mary Denny’s home at the southeast corner of Union Street and First Avenue (then still named Front Street) appears on the far right of the pan. The lawn – the family cow’s pasture – behind their long home separates it from the family barn that sits here at the southwest corner of Second Avenue and Union Street. Continue one block north on Second (towards the hill) and you come to Pike Street. There at the northeast corner sits the barn – with the shining roof – for the city’s horse trolley. The “bobtail cars” began running in 1884. The line of the tracks can be seen extending down Second Avenue. At Pike the rails turned one block west to First and then turned north again for the final leg through Belltown and eventually as far north as lower Queen Anne. Continuing now north on Second Ave. from Pike Street, its intersection with Pine is just missed off the page to the right. Third Avenue ascends from the scene’s center. In this neighborhood humbler homes were mixed with a few mansions. The Italianate style was popular in the 1880s and a few examples can be found in the pan. Many of the lots were large ones with room enough for a generous garden, a few fruit trees and a lawn. Many properties were separated from their neighbors and the city’s often elevated wood plank sidewalks by picturesque picket fences. Second Avenue was graded (smoothed) in 1883, in plenty of time to lay the trolley tracks. I must confess that in this panorama the church – the sanctuary – is itself split. When I merged the overlapping sides, left and right, the buildings all fit as I expected that they would. I chose to make the cut near the center of the church. But then looking above the church roof to the greenbelt on the south side of Union Street where it holds the northern border of the U.W. campus on Denny Knoll, I learned that although the two parts of the pan were photographed from same place on Denny Hill they were not taken at the same time – not even the same season. To elaborate we need to first identify the territorial campus’ main building. It is, of course, the white box on the knoll with classic columns presented at its front door on the west façade that faces both the community and Puget Sound. On the other or east side of the school is the large leafy Maple that still had another twenty years before it was cut down. And here is a surprise. In the left half of the panorama the leaves on the maple have dropped but not on the right half. The line or border between the part of the tree with leaves and the same tree without leaves is obvious. What’s more there are lots of leafy trees on the right half of the pan and none that I can find on the left side of it. Also the left hand side of the pan is exposed to a sun that can still light the northern sides of the buildings before its flight south, while the light on the right half of the pan is flat or flatter. These differences border on the mysterious, for how does one join a northern light with a leafless neighborhood? But we must allow it and remember that this neighborhood is not on the “true compass.” That may account for it. I will speculate that the mysterious photographer took the right hand or western panel first and later in the year returned to take the left half, thinking that a pan that included the city growing up First Hill was more marketable than one merely of the “old” city. The university’s main structure for classes and offices was built on Denny’s Knoll in 1861 near the northeast corner of 4th Avenue and Seneca Street. Fourth Avenue then stopped at Seneca and did not proceed north through the campus. It resumed its path north of Union Street – as it does still in the panorama. (And returning to the tease, that is a telling clue for finding the mid-block on Pike between 5th and 6th Avenues.) Behind and to the left of the university, is Providence Hospital, which was enlarged throughout the 1880s, as the Catholic sisters care was much the most popular in town. Here it has but one tower. Soon it will have three. The hospital faced Fifth Avenue between Madison and Spring Streets, where stands since the early 40s the federal courthouse. The grand white box to its left is Central School. It nearly fills the block bordered by Madison, Marion, 6th and 7th Avenues. It opened on May 7, 1883 and burned to the ground in the spring of 1888. Coming again to the photographer’s side of the university’s main building, another white box is snug in the green belt. This is the three-story home for the Young Naturalists Club. This society of scientifically curious specimen collectors was the beginning of the Washington State Museum, which in 1985 celebrated its centennial in its present modern home, the Burke Museum, on the U.W. Campus. On the First Hill horizon of the left-hand panel are a few landmarks that in 1885 were nearly new. Coppins water tower (and works) pokes up about one-third of the way into the scene from its left border. To its left is Col. Haller’s mansion Castlemount with its own tower at the northeast corner of James and Minor. On the far left is the green belt covered in last week’s offering, that of the steepest part of First Hill where University Street climbs – or attempts to – between 8th and 9th Avenues. This generous document is, of course, filled with many other identifiable landmarks but we will take mercy and exit this tour here – except to add what follows. For all the familiar charm that entwines this mid-1880s scene, the year 1885 was remembered by pioneer historian-journalist Thomas Prosch, then the Post-Intelligencer’s editor, as characterized by “a great deal of ugly feeling . . .the times were hard and the hands of all seemed to be raised against others. Grievances were common and relief measures took violent shape.” The economic depression that followed the economic crash of 1883 kept the times dull in spite of the flood of immigration that followed the completion also that year of the Northern Pacific’s transcontinental. The new railroad brought west a hopeful flood of single men looking for work, but what they found were opportunities that required not labor but cash. Those who had the where-with-all to buy land in 1885 had golden futures – at least until the next crash in 1893. The result was a volatile split between labor and capital that erupted into race riots in both Tacoma and Seattle, which must have tested Pastor Anderson. The scapegoats of working class resentment were the Chinese and the capitalists who exploited their relatively cheap but effective labor. Coincidentally, the Seattle Municipal Archives posted a 1886 photo to Flickr just this week! Check it out here. What’s odd is that your 1885 panorama has buildings missing in SMA’s shot, particularly in the green of the university. Which one’s got the wrong date? I took my best shot at a “Now” photo for these, from on top of the Macy’s parking garage (posted in the SMA photo). I think it’s pretty close? I think that the 1885 shot has buildings that are missing in the Muni Archive’s shot, which they have dated 1886. For instance, you can see the Swedish Lutherans and the Naturalists are both missing in that 1886 view so it is no doubt from before 1885. I have a hope to line up all the views taken south from Denny Hill to date them and also name structures. The ones I know. But I lots of hopes and this one like many of those will not be fulfilled soon. I have a friend interested in participating in the adventure, perhaps the two of you should take the ball and run with it – or mark it up. The muni shot is a bit too low resolution for me to study in detail. Perhaps I will call them and ask that a higher res be sent to me via e-mail. The evidences of First Hill are important to dating because he know the dates that certain homes were put up. But we got to be able to “read” them before we can date them. Thanks much and keep searching. Do you go out repeating historical view very often. If so send some examples. Or if you want old shots to explore, let me know and I’ll send you some puzzles. I also noticed that the Central School is missing in their shot, so it’s from before 1883. I would love to jump into the Denny Hill project with your friend, so please hook us up. I know what you mean about having too many “hopes” and back burners, but committing to a project with a partner seems to make things more urgent. Also, please send a few old photos my way! I only recently started taking “Now and Then” shots. I’ve got twelve up on Flickr, http://www.flickr.com/photos/tigerzombie/sets/72157620032140322/ . In June I did a few in Tokyo that are matched to 1880s photos that the New York Public Library uploaded to Flickr. In the last couple of weeks I started doing Seattle scenes from SMA. On Wednesday I’m headed to Indianapolis, and while I’m there I’ll take a couple of shots that the Library of Congress uploaded. It’s incredibly fun, and I’m excited to explore your puzzles. BTW, congratulations on the Ivar’s spelunking!